Youth Flag Football promotes physical fitness and teaches youngsters valuable football lessons about teamwork and fair play. Beginning June 1st, boys or girls may sign up for the Fort Scott Youth Tackle League. 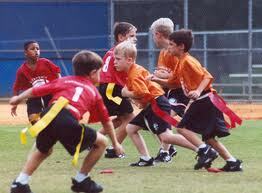 A select team will play in the Allen County Youth Football traveling league and will be guaranteed 6 games. Games will be played on Tuesday evenings. The division of teams will be selected by USA Certified Coordinator & USA Certified coaches. This league is not a FSRC program. LOCATION: Practices will be held on Mon/Wed from 6 p.m. to dark across from the FSMS.